Venue - Guildford RFC KO 1400hrs Sunday 12 March 2018. Surrey would firstly like to thank Buckinghamshire for accepting this County U15 fixture at very late notice when our original opposition had pulled out. Secondly, we would also like to thank Guildford RFC for hosting this event and welcoming all parents and players; they were most accommodating making the afternoon run very smoothly. Now to the rugger; this was the first match at U15 for both sides and conditions were superb for rugby and what was an excellent display by Surrey of clinical skills employing all the RFU Principles of Rugby equating to an outcome of success. 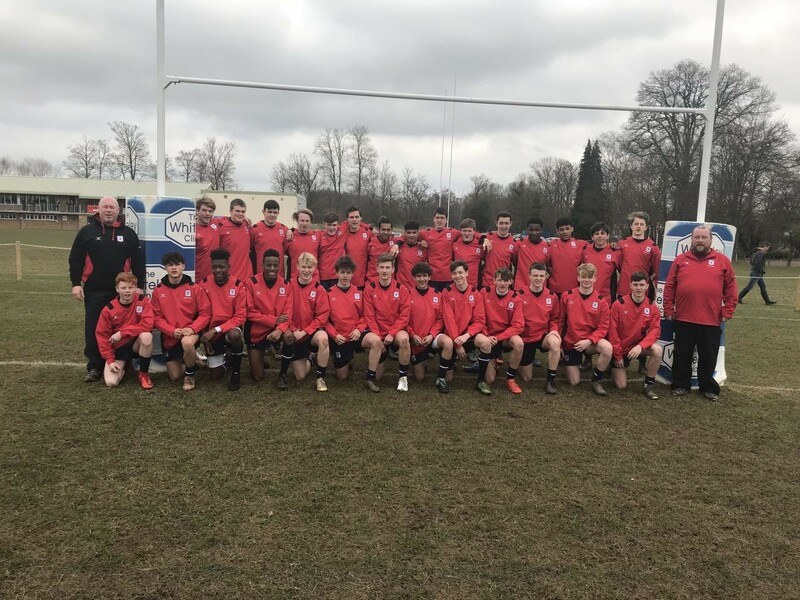 However, we must not take anything away from Buckinghamshire who played the game with excellent gusto and resilience; they never stopped trying to counter attack and penetrate our defence with many periods of open expansive rugby. However, Surrey County U15 proved too strong in all aspects of the game. In defence Surrey halted their game philosophy with superb line speed and tackling, which one could turn around and say attacking defensive lines, really pressurising Bucks attacking line stopping them penetrating the gain line. We pushed forward and on numerous occasions hitting them on the tackle line. On one particular occasion within our 22m line our defensive line speed was up fast pressuring Bucks where Surrey winger, Tom Bushell, intercepted and ran the full length of the pitch to score under the posts. So to our attack that was an extreme please to watch; for U15 boys to steal, jackle, turnover ball or win at set play to then maintain possession through several phases earning the right to go wide were skills many would believe far beyond this age of cognitive and physical development. Our philosophy was to tie in the opposition stretching them around the corner and attack back across the grain hitting gaps, this they did with close support securing possession for quick presentation for the scrum half to feed the next runners. They picked the correct time to tip on and pull the ball back to allow the supporting players to pass wide with accuracy to our fast wingers, namely Kamdi Dozie-Ajaegbu, Seom Shaw and Tom Bushell who all scored 2 tries each displaying excellent leg speed outpacing the opposition with 'in and out' running lines out wide. Surrey employed great decision making with innovative skills by observing the opposition and attacking where there were not; this was highlighted with Bucks quick defensive line speed to pressurise our attack where our centre grubber kicked through with a perfectly weighted kick that bounced into the winger's arms to run in for a score. To conclude, Surrey scored 13 unanswered try's converting 8. Final Surrey won 81-0. Try's; Harry Benton (1), Henrique Gabriel (1), Max Campbell-Harris (1), Luke Wyllie (1), Kami Dozie-Ajaegbu (2), Tom Whitely (1), Nathan Jibulu (1), Seam Shaw (2), Tom Bushell (2), Goerge Inoke (1). A marvellous first win for Surrey County U15 Season 2017-18.